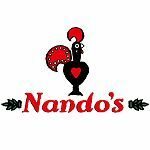 Nandos is known for its chicken dishes and its very hot Peri-Peri sauce. 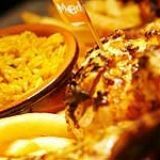 Choose from a range of starters, chicken burgers, marinated chicken dishes and salads served with a variety of sauces and side-orders. Their sauces range from the mild to the very spicy and bottles of their speciality sauces can also be bought to take home. Nandos also serve a range of alcoholic and non-alcoholic beverages. Small outdoor area in front of the restaurant.